“WOW! This place is HUGE!” seriously, we all gasped when we saw the vast space and the selection of endless play opportunities surrounded by purple and green hills of astroturf. There are several play areas spread out across one massive space. We had to explore all the different areas before settling down at one spot. It’s like a Teletubbies land, with silver funnels sticking up on the green hills. There are hidden slides, where you can jump in from on top of the hill, travel through and pop out into another section of play area. There’s also a long orange tunnel which has you crawling through the hill, so much fun! There is a massive spinning satellite dish (not for the faint-hearted) and are three metal slides – be warned they will get hot in summer. 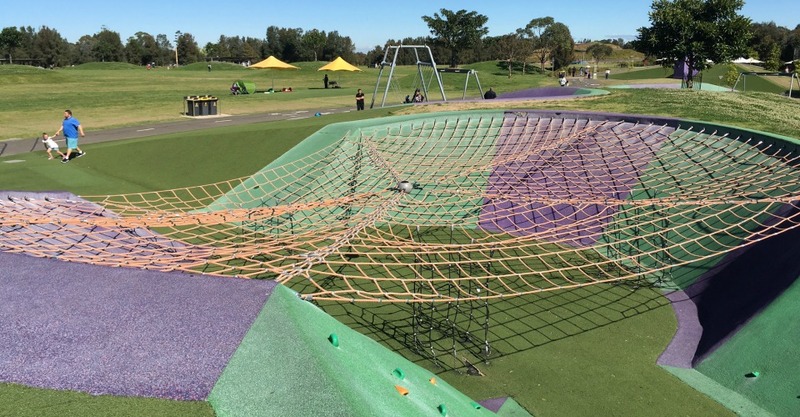 You can practise climbing skills on the suspended ropes and then enjoy a scooter or cycle along the pathways. If that isn’t enough, there is a viking swing and a double flying fox. There is one shaded area with climbing ropes towards the back of the park (near the kiosk). The Water Play: It was a hot morning, so this was the obvious spot to head to first. It’s a flat area surrounded by raised slopes of astroturf. The water starts spraying from 10am-4pm. It doesn’t flow continuously but spurts out at random then stops for a few minutes. There is no particular pattern that we could figure out. It is quite funny to watch the children wandering around staring down at the various spouts, tapping them with their feet and wondering where the water has gone. They get bored and mooch about a bit disappointed by the lack of water, then all of a sudden it bubbles to life. 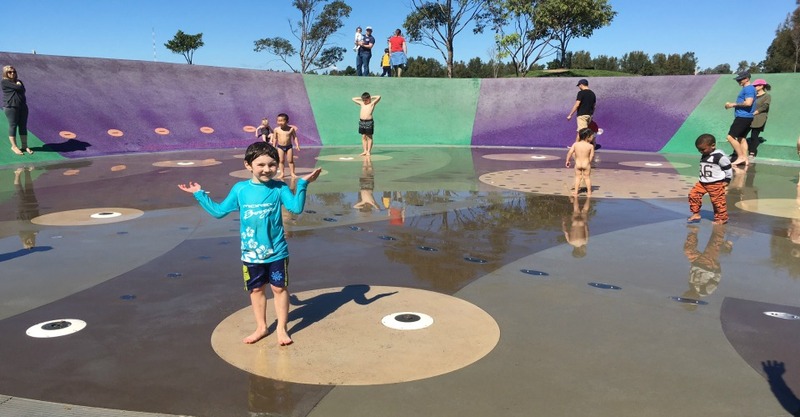 The sprinklers burst open and water pours out to the delightful shrieks and laughter of the children as they all come flooding back to the water area. Next to the water play is a large wooden climbing fort. There is an enclosed rope bridge and a few hidden cubby areas, great for imaginative play. To climb the fort, you have to pull yourself up the 90 degree steps, it’s aimed at those with great upper body strength. I managed to heave myself up to get a few birds-eye view photos. It would have been nice to slide down, but no, I had to use my core strength and balancing abilities to descend. 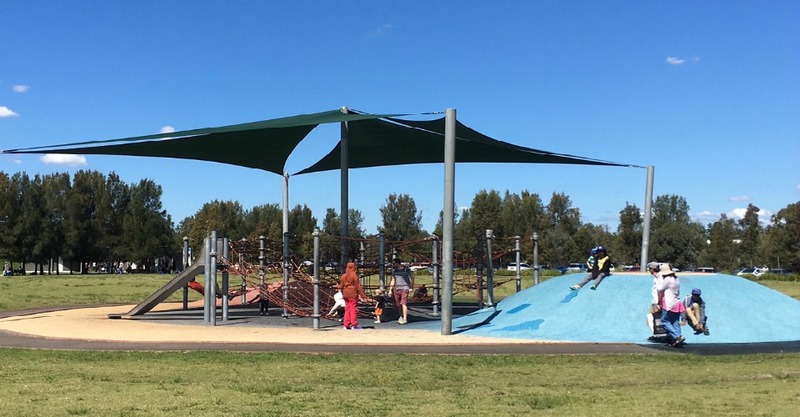 There is no shade over most of the play equipment, however, there is ample shade dotted around the park by the means of permanent umbrellas and trees. It seems to be a popular spot for birthday parties and family gatherings. There were people claiming umbrellas and setting up to secure their spots of shade and wheeling in trolley loads of food and drinks for the day. If you want to see the whole park and you are feeling up to it, you can hire a bike. They have mountain bikes, hybrid, small bicycles, bikes with child carriers, tandem and tricycles. Rates for one hour are from $10/$15 and you can hire in hourly slots or for the full day. Nearest cafe: There is a small kiosk which sells pre-made salads, wraps, baguettes ($10.00), coffee/drinks, snacks including muffins, gingerbread men and a few other treats, all at reasonable prices. The kiosk also sells swimming nappies which have to be worn in the water area if your child is not toilet trained. The kiosk is open: Monday –Friday 10am-4pm, Weekends 9am-5pm, School/Public Holidays 9.30-4.30. If the weather is bad, it’s closed. Toilets: Behind the kiosk is a water filling station and two toilets with a change table in each. The toilets are a little lacklustre – they could do with a fresh paint or possibly a fun mural to liven them up! 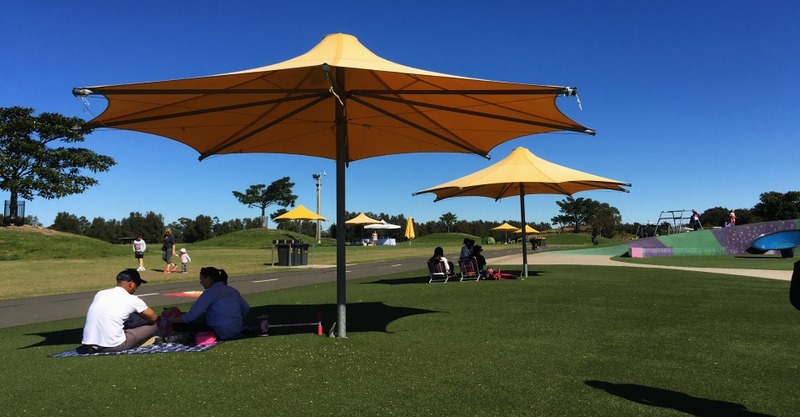 Shade: There are loads of umbrellas for shade, as well as trees which offer shade in the morning. 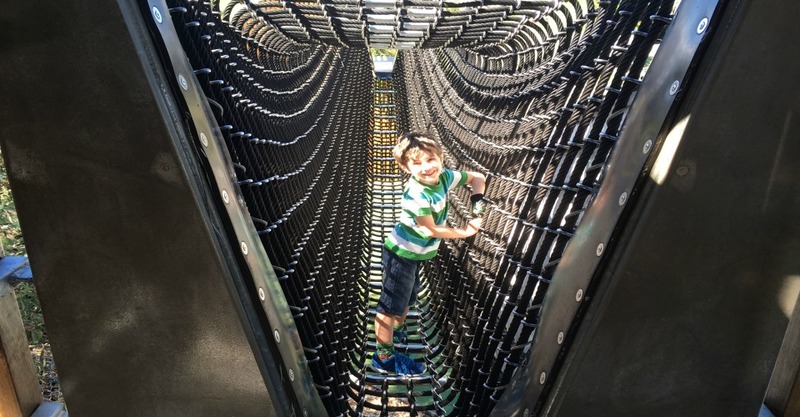 Enclosed: The park is large, sprawling and all of the areas flow into each other, but it isn’t fenced off, so always keep an eye on your little ones. Parking: There are two parking lots, a smaller one closer to the play areas and a slightly larger one a little further away. I was told from a local mum that it gets very busy and you might not find a spot. We recommend heading to the park in the morning if you can. Public transport: The park is located at Sydney Olympic Park which has its own train station. From Central it’s roughly a 25 minute journey. Best feature: Most definitely the water play area! But be warned, if you are not prepared to get wet, do not enter the water area at all, even if you think there is no water coming out- it will suddenly spray… to the hysterical laughter of all watching. Hours: Sunrise to sunset everyday. Water play 10am-4pm. Bike hire is 9am–4pm.